Samsung Electronics America today announced ArtPC Pulse, a desktop PC that challenges traditional perceptions of how a desktop PC should look and operate. Stunningly powerful and strikingly beautiful, the ArtPC Pulse is a stylish desktop PC that adds style to any room with an elegant circular design and unique pulse lighting that also serves as a personalized notification feature. Additionally, consumers can customize for expanded storage with an easy-to-add module. 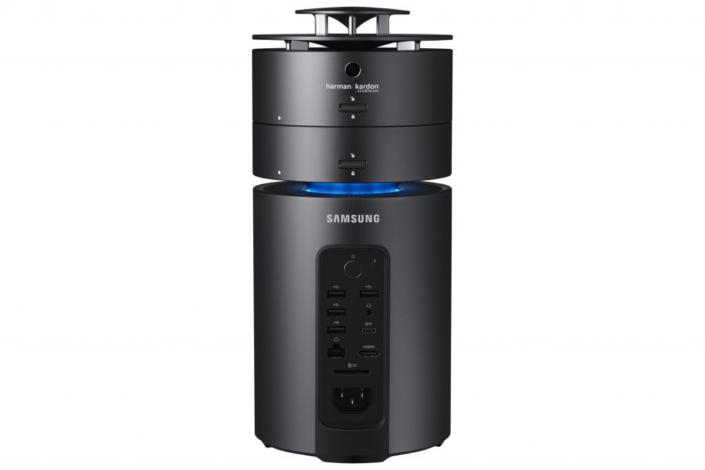 ArtPC Pulse is the epitome of elegant craftsmanship, taking Samsung’s renowned PC designs to the next level with a gorgeous, distinctive cylindrical body. The PC has an ambient pulse lighting band embedded within the circular design, seamlessly adding both style and function. For easy updates from anywhere in the room, the band can be customized to provide Smart Notifications via subtle, attractive lighting changes. For example, users can set the ArtPC Pulse to blink yellow when they have a new email, blue for a social media notification, green for a new chat message and more. Additionally, the customizable Hourly Chime function ensures users never lose track of time by giving them an option to set visual or audio alarms. The ArtPC Pulse’s circular, full metal body design houses high performance internal components in an elegant, compact (5.5 inches wide and around a foot tall) form factor. It has a 6th generation Intel Core i5 or i7 processor, AMD Radeon RX460 GPU, up to 16GB of memory and a 1 HDD module, plus 256GB SSD for faster load times and performance. ArtPC Pulse meets users’ needs to accomplish everything on their plates, as well as stay entertained, with support for demanding multimedia including 3D games and 4k movies. The 360° Harman/Kardon speaker matches the PC’s premium design and powerful performance with equally high-end, rich sound quality. The speaker is also customizable, with options for specific audio effects, sound balancing and more. The ArtPC Pulse is easy for consumers to modify based on their changing needs. An additional 1 TB HDD storage module is included with the Core i7 model***, for housing even more photos and movies. Additionally, a number of ports, including four USB 3.0, a USB Type-C and HDMI, are included so users can easily connect the ArtPC Pulse to all of their components and devices. ArtPC Pulse also ships with a wireless keyboard and mouse for convenient use right out of the box.